Understanding how the digestive system functions can clear up why colon detox is so beneficial. After acids have broken down the food in our stomach, that food enters the small intestine in a semi-liquid state. 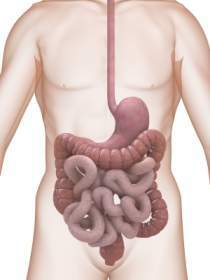 The small intestines are where most of the chemical digestion and nutrient absorption takes place. The food (now called chime) moves through the intestines by peristalsis - muscular, wavelike contractions. The purpose of peristalsis in the small intestine is to mix up the chime as much as possible. But all that mixing also helps to keep it moving along the digestive tract. The chime eventually makes its way to the large intestine, or colon. But it's not a constant process, like the movement in the small intestine. Instead the small intestine dumps its contents into the colon one to three times per day in mass movements. And yes, healthy bowels do require elimination one to three times per day. If you're not that regular, you can be sure your "sewer" is backed up. And you would benefit greatly from a natural colon cleansing. Here are some great natural colon cleansers.